Up in Scotland, there’s no shortage of incredible landscapes for you to explore. However, one place could stake a claim to being the best of the bunch. The Great Trossachs Path in the heart of Loch Lomond and the Trossachs National Park (Scotland’s first national park, created in 2002) – is a particular delight, comprising of spectacular landscapes and wildlife. It’s only an hour’s drive away from busy cities, too. 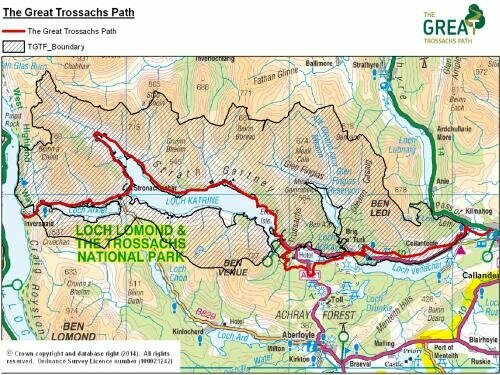 Here’s all you need to know about the Great Trossachs Path if you’re thinking of visiting. With rolling hill ranges, magnificent mountains and lovely lochs, it’s no surprise this part of Scotland was singled out for its beauty. Loch Lomond and the Trossachs National Park is the fourth largest national park in the British Isles, covering a massive 720mi². The Great Trossachs Path stretches for 30 miles (48km), throughout which visitors will trek through some seriously stunning scenery, and historic areas to boot. Whether you want to do the entire path as quick as possible or spread it out into a longer trip, it is ideal for walkers, cyclists or even experienced horse riders. There are plenty of different routes you could take, so no visit to the path need be the same. But where exactly does it go? Kicking off in Inversnaid and heading to the Trossachs Pier, the path links the West Highland Way with the Rob Roy Way. It’s a 28.5km route to begin with, along which there is some steep and rough terrain, but also beaten walking and mountain bike paths. This trip will probably account for your first day, as it takes around 7.5 to 8 hours to complete. Oh, and there’s a 534m ascent, so make sure you’re wearing comfy shoes! Along the way you’ll pass some amazing views of waterfalls, the charming 18th Century Garrison Farm, the Arklet dam and some excellent little tea shop/bistros. The second stage of the Great Trossachs Path will take you from the pier to Callander, along some minor roads and tracks in the forest. You’ll cross the footbridge over the Achray Water before enjoying views of Ben A’an and Tigh Mor, which is a beautiful holiday spot. The open landscapes through Achray Farm are breathtaking. Your second day (presuming you do it all in one day) is about 19km, and so will take somewhere around the 4.5- to 5.5-hour mark. You’ll need somewhere to call home along your trek, and what better place to stay than Tigh Mor? The ‘big house in the Trossachs’ has undergone a multi-million pound transformation over recent years, turning it from a neglected hotel into 76 stunning apartments and cottages, complete with a fully-equipped leisure centre. Are you looking for somewhere to get away from it all and head out into nature? Well, we couldn’t think of a better route for you to follow than the Great Trossachs Path.